Maintain an S-Corporation – Should you be one? My new realtor friend might be able to implement strategies that could save Him thousands a year, depending on His situation. We run into that all the time, where people have been with a “tax person” or a “bookkeeper” for a number of years, but they’ve never sat down with a pro-active planner to help them discover how to make sure they pay their fair share, and not a penny more. We’re a Lakeville tax and accounting firm that’s dedicated to helping people maximize their efforts and focus on their business. The way we do that is by handling their annoying bookkeeping, tax filing, tax planning, payroll, and accounting functions and then make sure they pay ONLY your fair share in taxes. One of the most basic things we do for each business owner is to examine whether or not they should use an LLC or an S-Corp strategy. A – You can become either an “LLC taxed as a sole proprietor” or an “LLC taxed as an S-Corp”. For purposes of clarity, I’ll be referring to them as “S-Corps” or “LLC’s” although technically they are both LLC’s. B – In an LLC, 100% of your net profits are subject to social security and medicare taxes which we call “self-employment taxes”. The Social Security portion is due on all net profits up to the social security limit of about $118,000 and medicare is due above and beyond that limit. After you pay the self-employment taxes, you then pay state and federal income taxes. If you have never set yourself up as a company, you are taxed as a sole proprietor as a default. Are you an S-Corp yet? Do you know why? Have you been shown the different scenarios? A good tax planner will take into account your personal goals, balance sheet, spouse’s income, industry norms, and much more to determine a short term and long term tax plan. The goal is usually to pay only your fair share to uncle sam, unless you love government to the extent that you donate to them more than they require of you….. Even if you didn’t make anything, you’ll want to make sure you file a zero report. Mark says that the IRS is like a suspicious boyfriend or girlfriend, because if you don’t call them they will always assume the worst. This means that it’s not alright for small business owners to blissfully wait till the end of the year to sit down and finally do their tax filing. While the S-Corporation is extremely helpful for tax reduction, there are some pieces of bureaucracy that you’ll have to jump through – which is what we specialize in taking care of all this with a complete, all-inclusive service for small businesses. There are some other bureaucratic things you’ll want to make sure you do as a company, particularly so you keep it bona-fide. Annual meetings, shareholder meetings, company books, by-laws, minutes, and stock certificates are all part of what He calls “company maintenance”. This is important so that you will be a separate company and create a bona-fide “corporate veil”. Again, this is about making sure you pay your fees and file anything required to keep you in good-standing. The state can involuntary dissolve your corporation and you will no longer have one. 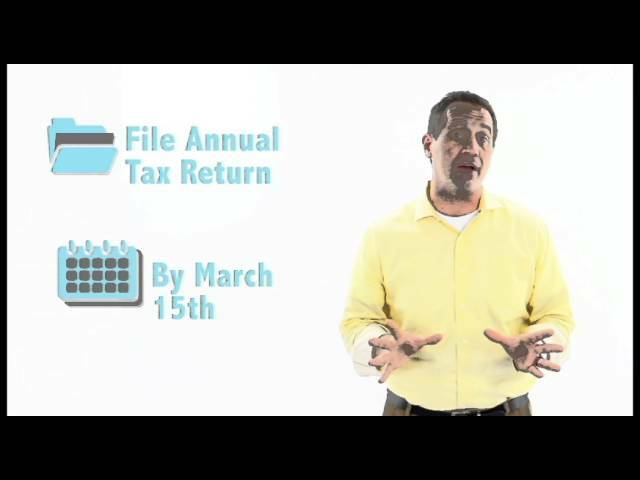 You will now have a corporate tax return due, which is often more expensive to have prepared and is due on March 15th rather than April 15th. It’s easy to file an extension, but if you’ve become and S-Corp, it is critically important that you put together and file a good tax return for your corporation. It’s also important that you don’t assume your bookkeeper or tax person is on top of things, We meet people every week that haven’t been given the right advice and have failed to file the appropriate returns. To conclude, We want you to know that an S-Corporation is a very helpful and powerful tool to implement and possibly mitigate your taxes. Self-employment taxes are 15.3%, which is hefty enough where mitigation can create tremendous savings. Think of it this way, for every $10,000 in profit which is not subject to the 15.3%, you save $1,530. If you had $100,000 subject to self employment taxes, and then maneuvered to legitimately have only $30,000 subject, you would save about $10,710 in self employment taxes. These results aren’t guaranteed, and each situation needs planning. This is why we provide our service that includes almost everything needed to take advantage of the tax benefits of the S-Corporation. 3 – Tax Planning – Pro-active, and ongoing tax planning to manage the tensions of Salary, Payroll, Deductions, and Retirement plans so you pay your fair share and not a penny more. 9 – Financial consulting, advice, and oversight for your business and it’s operations. We always connect in person, do a free analysis to see if we would even be valuable, and then present a precise quote. Email please contact us and we’ll connect over a cup of coffee or at our office!